I used to be under the impression that one has to pay through the nose to have good French cuisine in Singapore. Especially for a heavy eater such as myself, I thought French fare, which typically is served in bijou portions, would leave me unsatisfied after my meal. 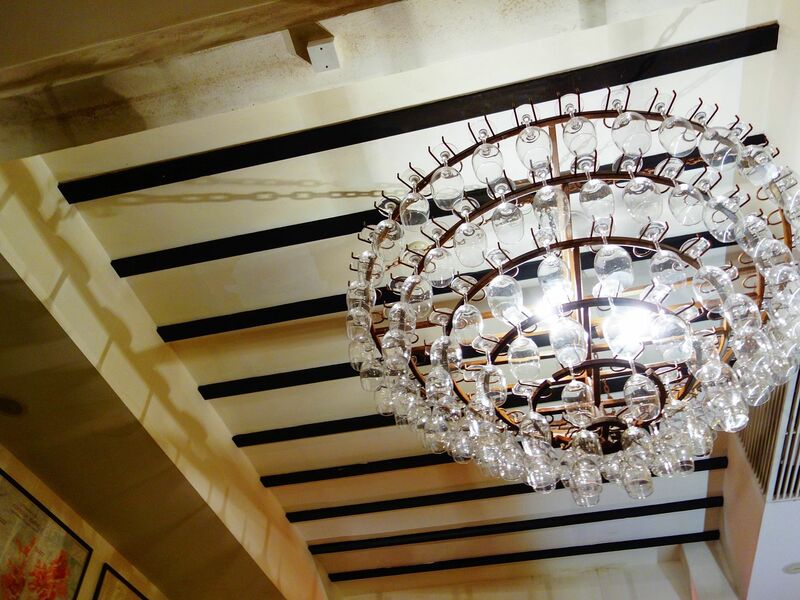 Le Bistrot du Sommelier, however, proved itself as a great exception. 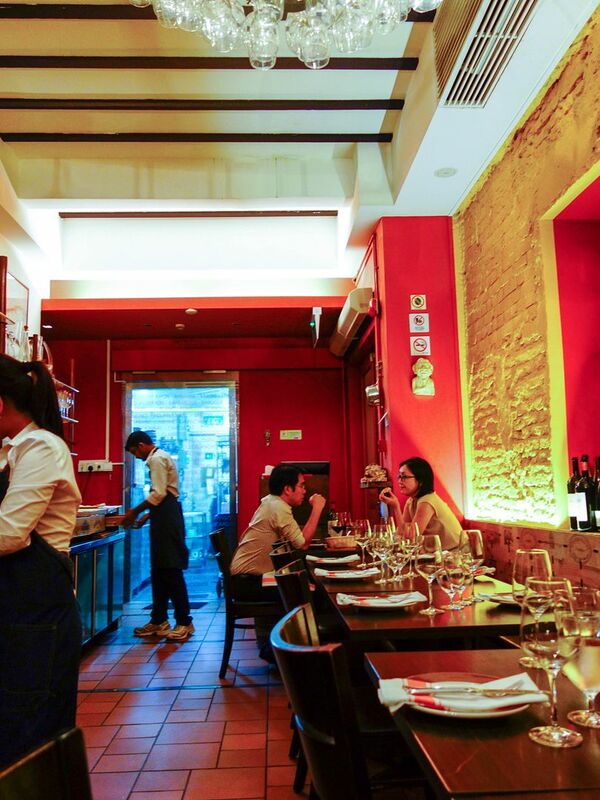 Le Bistrot du Sommelier’s reputation has grown tremendously since its humble beginnings at Prinsep Street in 2008. 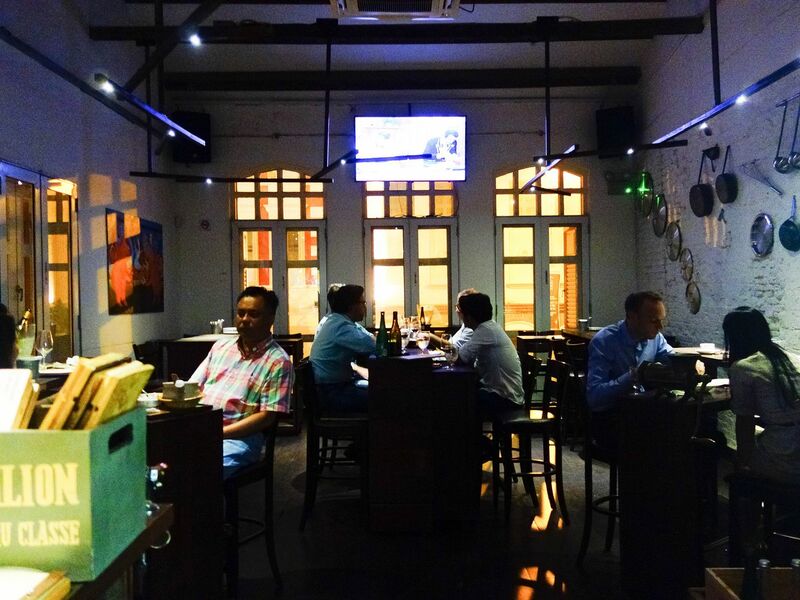 The two-storey establishment, now located at the corner of Armenian Street, houses a rustic dining hall on the ground floor and a rillette bar upstairs. Not only is Le Bistrot du Sommelier itself gaining recognition but its Chef de Cuisine, Brandon Foo, made his mark earning the accolade of “Rising Chef of the Year” at the World Gourmet Summit 2014. As the name suggests, the restaurant serves French bistro-style food, which I interpret as hearty, homely, unpretentious meals. The food may be simple but can be executed superbly. The portions are served as if you are a guest at someone’s home for dinner, which can be ideal for sharing on dates, or with family and friends. Not forgetting the wine menu, Le Bistrot boasts an impressive selection of champagnes, sweet wines, bordeaux and burgundies. Just ask the knowledgeable waitstaff for recommendations! 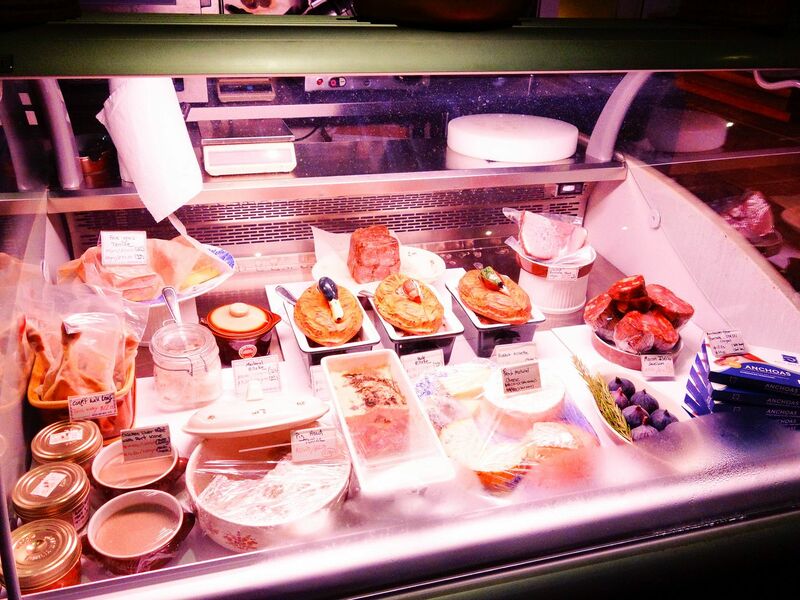 I began my meal with Le Bistrot’s famous charcuterie (cold cooked meats). Rillettes and terrines are very similar to pâté with rillettes being like a smooth paste while terrines have a more coarse consistency. They’re typically eaten with slices of baguette as a light appetizer or a standalone snack with a glass of wine. The mackerel rillette served at Le Bistrot was very fresh as it tasted like the sea. 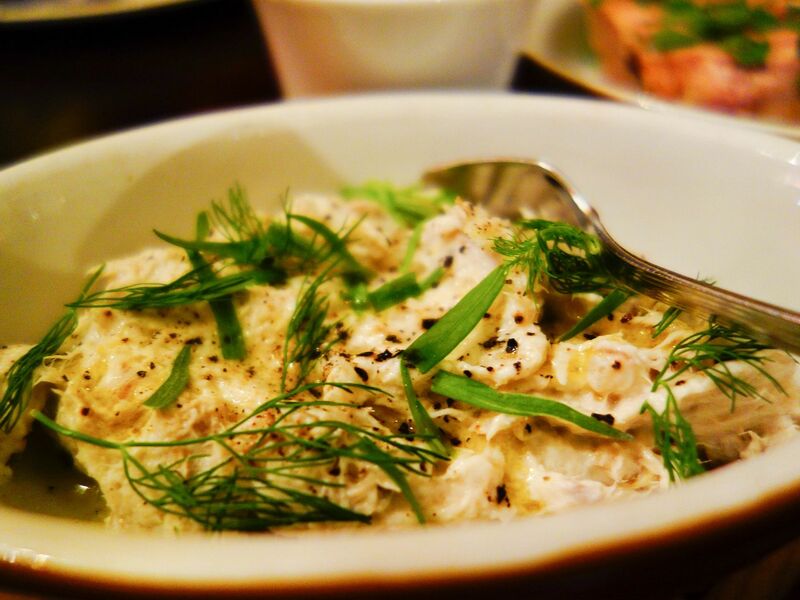 The rillette was very flavourful and had a wonderful texture due to the oily nature of mackerel. The country style pork terrine also made for a good starter and its deliciousness had to be attributed to its high fat content. 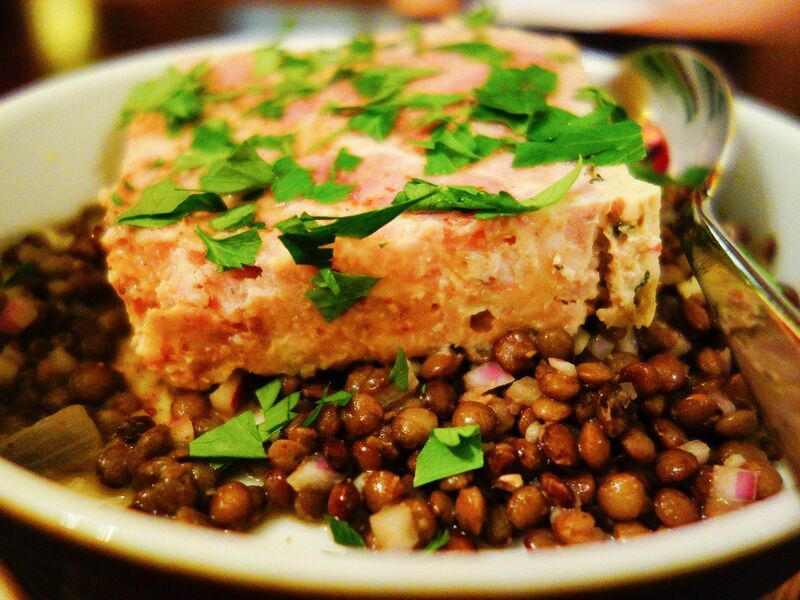 This would appeal to anyone who hasn’t tried pâté before as it is very easy going. My favourite would be the duck foie gras terrine. 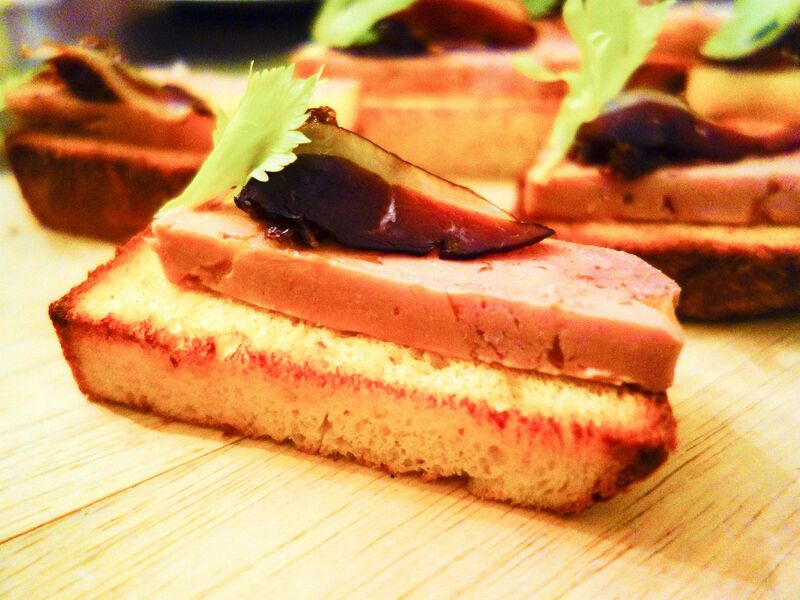 The foie gras is served with sweet crunchy brioche bread, which brings a pleasant contrast with the melt-in-your-mouth slab of foie gras. It had to be the best foie gras I’ve had thus far. This was a seasonal dish that I absolutely loved. Perhaps, it’s because I’m a big fan of both figs and blue cheese. 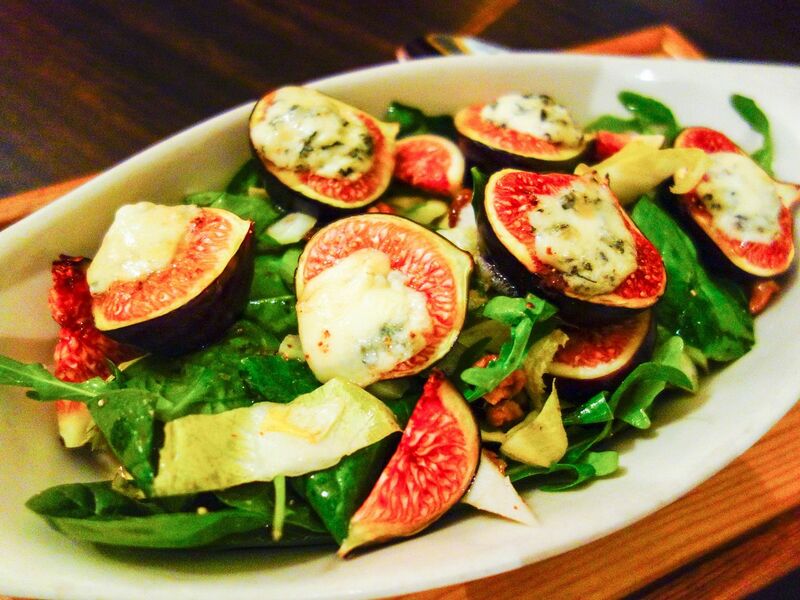 A handsome dollop of warm melted blue cheese was set on top of each halved baked fig. This brings out a smoky taste from the fig’s creamy interior. The savouriness of the cheese, figs and celery is complemented with the sultanas and sweet walnut dressing. An onglet, which is French for hanger steak, is one of the rarer cuts of beef. It comes from the underside of the cow, hanging between the rib and the loin (hence the name). Naturally, the onglet is packed with loads of flavour but also may have a grainy texture due to the strong fibres. The long muscle fibres tend to make the meat dry out more quickly as well. 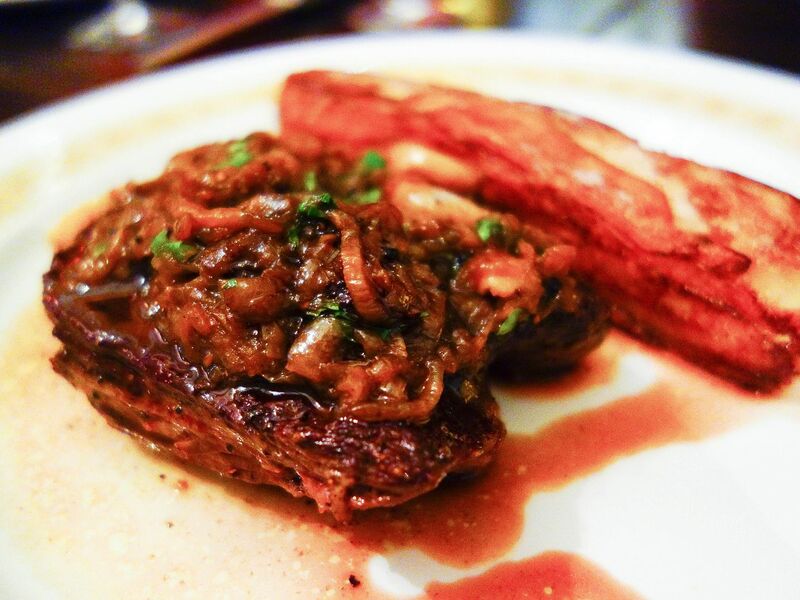 Le Bistrot serves the pan-seared onglet with a marinade of shallots and garlic confit to retain the moisture and flavour of this beautiful meat. This bistro steak is inexpensive and has great value. 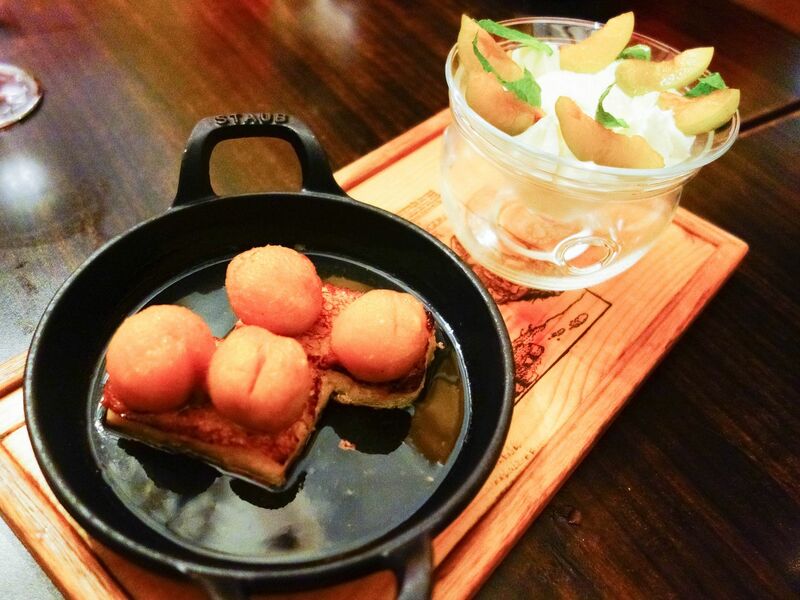 The name of this dish is quite a mouthful, and so is the dish literally. 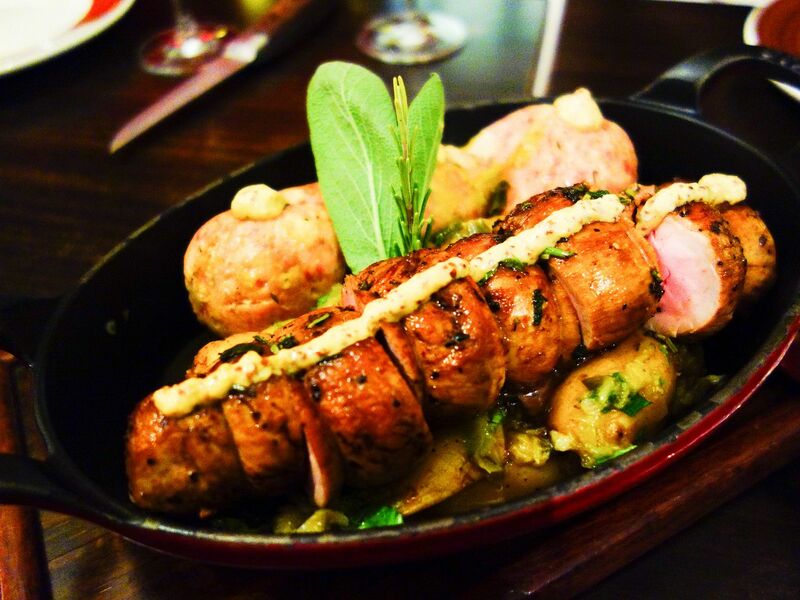 It translates to pork tenderloin and garlic pork sausage with papet vaudois (a mixture of leek and potatoes cooked into a purée). Both sausages had sizeable girths which can make for a very filling meal. The textured and chunky sausages are made in house, easy to chew and wonderfully delicious. This dessert was amazing. 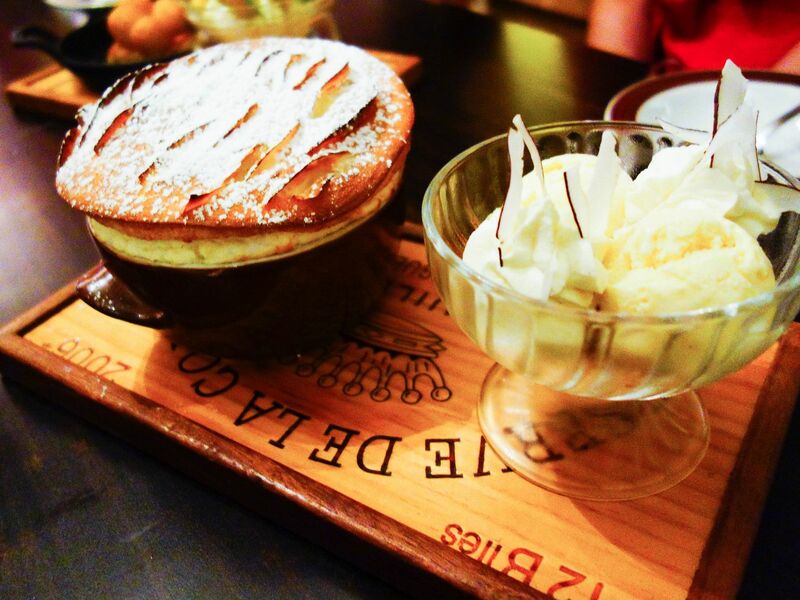 It was hard to believe that such a large soufflé could rise so beautifully and even more, hold its shape. The soufflé itself was not too eggy or wet. The infused coconut flavour was subtle and refreshing, making this dish polished. The accompanying homemade coconut ice-cream garnished with coconut shavings is sweeter than the ones you find in Chatuchak Market in Bangkok, which is typical in French cuisine. Another seasonal dish and star of the night was the poached Reine Claude plum served with bread pudding and vanilla ice-cream. The Reine Claude (Queen Claude) plum, also known as a greengage tastes immensely sweet and complex, almost syrup-like after poaching, which is a perfect accompaniment with the simple bread pudding and vanilla ice-cream. Le Bistrot du Sommelier impressed me from start to finish with the scrumptious food and the impeccable service. Honestly, I’m not very learned in French cuisine but the host and waitstaff brought me through each course as they possessed a good knowledge of the ingredients that go into each dish. I also enjoyed the fact that they constantly update their seasonal menu (up to 3-4 times per year) to take advantage of fresh seasonal produce. 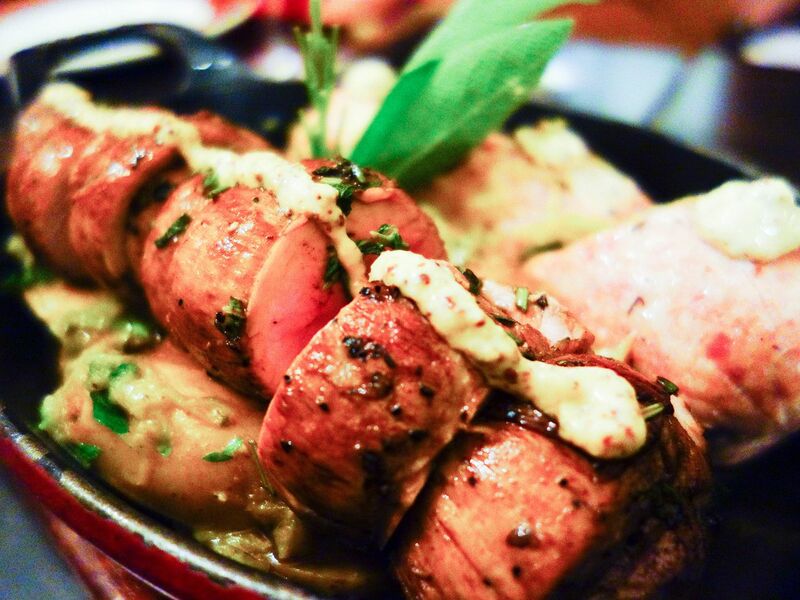 It gives anyone more reasons to return and dine at this remarkable bistro. I would also advise to make reservations prior to your meal to avoid disappointment. Le Bistrot du Sommelier also has a prix fixe lunch menu at a decent $35++ for three courses. It is titled the TGV lunch menu (Train à Grande Vitesse, a high-speed rail service in Europe) and is specially designed to allow busy guests to get a good meal during their lunchtime without compromising on taste, quality or service.